Farming the rich soil of the Central Valley is a Martino family tradition Bella Viva carries out with pride. We produce and sell exceptional fresh and dried fruit, nuts and chocolate to loyal customers at our stands in northern California's celebrated farmer's markets, in select restaurants and to our online customers across the country. Quality is of utmost importance to us here at Bella Viva. Growing the fruit that we dry and market enables us to have complete control over the fruit quality from the initial growing phase on through the final packaging and delivery. To our long-time customers, we say welcome back. To our new ones, we say welcome home to Bella Viva. Bella Viva Orchards Gourmet Valley Tray is the perfect healthy snack! I love that it comes in a gorgeously arranged tray that would be absolutely perfect for gifting to others. 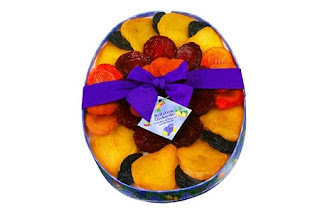 The pluots, pears, apricots, nectarines, pitted prunes, and peaches tastes incredibly delicious and make for one of the healthiest sweetest treats you can eat. I also really like that Bella Viva Orchards grows the fruit that they dry enabling them to have complete control over the fruit quality from the initial growing phase on through the final packaging and delivery. The quality of the fruit is incredible and the packaging looked absolutely perfect. I highly recommend Bella Viva Orchards Gourmet Valley Tray! Click HERE to learn more about Bella Viva Orchards! Follow Bella Viva Orchards on social media!